Let’s sit down here, all of us, on the open prairie, where we can’t see a highway or a fence. Lets have no blankets to sit on, but feel the ground with our bodies, the earth, the yielding shrubs. Let’s have the grass for a mattress, experiencing its sharpness and its softness. Let us become like stones, plants, and trees. Let us be animals, think and feel like animals. Listen to the air. You can hear it, feel it, smell it, taste it. Woniya waken- the holy air- which renews all by its breath. Woniya, woniya waken- spirit, life, breath, renewal- it means all that. Woniya- we sit together, don’t touch, but something is there; we feel it between us, as a presence. A good way to start thinking about nature, talk about it. Rather talk to it, talk to the rivers, to the lakes, to the winds as to our relatives. You have made it hard for us to experience nature in the good way by being part of it. Even here we are conscious that somewhere out in those hills there are missile silos and radar stations. White men always pick the few unspoiled, beautiful, awesome spots for the sites of these abominations. You have raped and violated these lands, always saying, “Gimme, gimme, gimme,” and never giving anything back. You have taken 200,000 acres of our Pine Ridge reservation and made them into a bombing range. This land is so beautiful and strange that now some of you want to make it into a natural park. The only use you have made of this land since you took it from us was to blow it up. 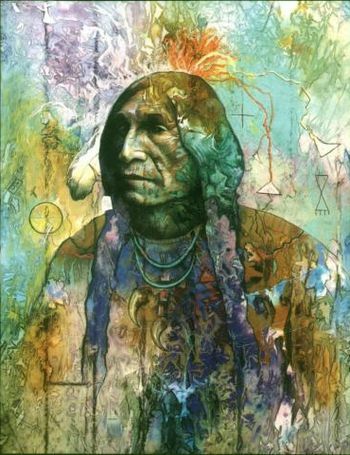 You have not only despoiled the earth, the rocks, the minerals, all of which you call ‘dead” but which are very much alive; you have even changed the animals, which are part of us, part of the Great Spirit, changed them in a horrible way, so no one can recognize them. There is power in a buffalo–spiritual , magic power–but there is no power in an Angus, in a Hereford. There is power in an antelope, but not in a goat or in a sheep, which holds still while you butcher it, which will eat your newspaper if you let it. There was great power in a wolf, even in a coyote. You have made him into a freak–a toy poodle, a Pekingese, a lap dog. You can’t do much with a cat, which is like an Indian, unchangeable. So you fix it, alter it, declaw it, even cut its vocal cords so you can experiment on it in a laboratory without being disturbed by its cries. A partridge, a grouse, a quail, a pheasant, you have made them into chickens, creatures that can’t fly, that wear a kind of sunglasses so they won’t peck each other’s eyes out, “birds” with a “pecking order.” There are farms where they breed chickens for breast meat. Those birds are kept in low cages, forced to be hunched over all the time, which makes the breast muscles very big. Soothing sounds, Muzak, are piped into these chickens hutches. One loud noise and the chickens go haywire, killing themselves by flying against the mesh of their cages. Having to spend all their lives stooped over makes an unnatural, crazy, no-good bird. It also makes unnatural, no-good human beings. That’s where you fooled yourselves. You have not only altered, declawed and malformed your winged and four-legged cousins; you have done it to yourselves. You have changed men into chairmen of boards, into office workers, into time-clock punchers. You have changed women into housewives, truly fearful creatures. I was once invited into the home of such a one. Sometimes I think that even our pitiful tar-paper shacks are better than your luxury homes. Walking a hundred feet to the outhouse on a clear wintry night, through mud or snow. That’s one small link with nature. Or in the summer, in the back country, leaving the door of the privy open, taking your time, listening to the humming of the insects, the sun warming your bones through the thin planks of wood; you don’t even have that pleasure anymore. Americans want to have everything sanitized. No smells! Not even the good, natural man and woman smell. Take away the smell from under the armpits, from your skin. Rub it out, and then spray or dab some nonhuman odor on yourself, stuff you can spend a lot of money on, ten dollars an ounce, so you know this has to smell goo. “B.O.,” bad breath, “Intimate Female Odor Spray”- I see it all on TV. Soon you’ll breed without any body openings. I think white people are so afraid of the world they created that they don’t want to see, feel, smell or hear it. The feeling of rain and snow on your face, being numbed by an icy wind and thawing out before a smoking fire, coming out of a hot sweat bath and plunging into a cold stream, these things make you feel alive, but you don’t want them anymore. Living in boxes which shut out the heat of the summer and the chill of winter, living inside a body that no longer has a scent, hearing the noise from the hi-fi instead of listening to the sounds of nature, watching some actor on TV having a make-believe experience when you no longer experience anything for yourself, eating food without taste- that’s your way. It’s no good. The food you eat, you treat it like your bodies, take out all the natural part, the taste, the smell, the roughness, then put the artificial color, the artificial in. Raw liver, raw kidney- that’s what we old-fashioned full-bloods like to get our teeth into. In the old days we used to eat the guts out of the buffalo, making a contest of it, two fellows getting hold of a long piece of intestines from opposite ends, starting chewing toward the middle, seeing who can get there first; that’s eating. Those buffalo guts, full of half-fermented, half digested grass and herbs, you didn’t need any pills and vitamins when you swallowed those. Use the bitterness of gall for flavoring, not refined salt or sugar. Wasna- meat, kidney fat and berries all pounded together- a lump of that sweet wasna kept a man going for a whole day. That was food, that had the power. Not the stuff you give us today: powdered milk, dehydrated eggs, pasteurized butter, chickens that are all drumsticks or all breast; there’s no bird left there. You don’t want the bird. You don’t have the courage to kill honestly- cut off the chickens head, pluck it and gut it- no, you don’t want this anymore. So it all comes in a neat plastic bag, all cut up, ready to eat, with no taste and no guilt. Your mink and seal coats, you don’t want to know about the blood and pain that went into making them. Your idea of war- sit in an airplane, way above the clouds, press a button, drop the bombs, and never look below the clouds- that’s the odorless, guiltless, sanitized way. When we killed a buffalo, we knew what we were doing. We apologized to his spirit, tried to make him understand why we did it, honoring with a prayer the bones of those who gave their flesh to keep us alive, praying for their return, praying for the life of our brothers, the buffalo nation, as well as for our own people. You wouldn’t understand this and that’s why we had the Washita Massacre, the Sand Creek Massacre, the dead women and babies at Wounded Knee. That’s why we have Song My and My Lai now. To us life, all life, is sacred. The state of South Dakota has pest-control officers. They go up in a plane and shoot coyotes from the air. They keep track of their kills, put them all down in their little books. The stockmen and sheep owners pay them, Coyotes eat mostly rodents, field mice and such. Only once in a while will they go after a stray lamb. They are our natural garbage men cleaning up the rotten and stinking things. They make good pets if you give them a chance. But their living could lose some man a few cents, and so the coyotes are killed from the air. They were here before the sheep, but they are in the way; you can t make a profit out of them, more and more animals are dying out. The animals which the Great Spirit put here, they must go. The man-made animals are allowed to stay–at least until they are shipped out to be butchered. That terrible arrogance of the white man, making himself something more than God, more than nature, saying, “I will let this animal live, because it makes money”; saying “This animal must go, it brings no income, the space it occupies can be used in a better way. The only good coyote is a dead coyote.” They are treating coyotes almost as badly as they used to treat Indians. You are spreading death, buying and selling death. With all you deodarants, you smell of it, but you are afraid of it’s reality; you don’t want to face up to it You have sanitized death, put it under the rug, robbed it of its honor. But we Indians think a lot about death. I do. Today would be a perfect day to die- not too hot, not too cool. A day to leave something of yourself behind, to let it linger. A day for a lucky man to come to the end of his rail. A happy man with many friends. Other days are not so good. They are for selfish, lonesome men, having a hard time leaving this earth. But for whites every day would be considered a bad one, I guess. Eighty years ago our people danced the Ghost Dance, singing and dancing until they dropped from exhaustion, swooning, fainting, seeing visions. They danced in this way to bring back the dead, to bring back the buffalo. A prophet had told them that through the power of the Ghost Dance the earth would roll up like a carpet, with all the white man’s works- the fences and the mining tones with their whorehouses, the factories and the farms with their stinking , unnatural animals, the railroads and the telegraph poles, the whole works. And underneath this rolled-up white man’s world we would find again the flowering prairies, unspoiled, with its herds of buffalo and antelope, its clouds of birds, belonging to everyone, enjoyed by all. I guess it was not time for this to happen, but it is coming back, I feel it warming my bones. Not the old Ghost Dance, not the rolling-up– but a new-old spirit, not only among Indians but among whites and blacks, too, especially among young people. It is like raindrops making a tiny brook, many brooks making a stream, many streams making one big river bursting all dams. Us making this book, talking like this- these are some of the raindrops. Listen, I saw this in my mind not long ago: In my vision the electric light will stop sometime. It is used too much for TV and going to the moon. The day is coming when nature will stop the electricity. Police without flashlights, beer getting hot in the refrigerators, planes dropping from the sky, even the President can’t call up somebody on the phone. A young man will come, or men, who’ll know how to shut off all electricity. It will be painful, like giving birth. Rapings in the dark, winos breaking into liquor stores, a lot of destruction. People are being too smart, too clever, the machine stops and they are helpless, because they have forgotten how to make do without the machine. There is a Light Man coming, bringing a new light. It will happen before the century is over. The man who has the power will do good things too- stop all atomic power, stop wars, just by shutting the white electro-power off. I hope to see this, but then I’m also afraid. What will be will be. This entry was tagged butterflies, lakota, lame deer, native american, owls, prophecy, richard erdoes, sioux, talking to the owls and butterflies. Bookmark the permalink.